The volume of a solid object is given a numerical value that quantifies the amount of three-dimensional space it occupies. 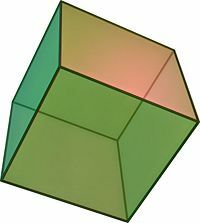 A one-dimensional object, such as a line in mathematics, or a two-dimensional object, such as a square, is assigned zero volume in three-dimensional space. In the thermodynamics of non-viscous fluids, volume is regarded as a "conjugate variable" to pressure. If pressure on the fluid is increased, its volume decreases; conversely, if pressure on the fluid is decreased, its volume increases. 7 Additional meanings of "volume"
Volume is sometimes distinguished from the capacity of a container. The term capacity is used to indicate how much a container can hold (commonly measured in liters or its derived units), and volume indicates how much space the object displaces (commonly measured in cubic meters or its derived units). Alternatively, in a capacity management setting, capacity is defined as volume over a specified time period. Any figure (integral calculus required) h = any dimension of the figure, A(h) = area of the cross-sections perpendicular to h described as a function of the position along h.
(This will work for any figure, no matter if the prism is slanted or the cross-sections change shape). Mathematically, the volume of a body may be defined by means of integral calculus. In this approach, the volume of the body is taken to be approximately equal to the sum of volumes of a large number of small cubes or concentric cylindrical shells, and adding the individual volumes of those shapes. The acre foot is often used in measuring the volume of water in a reservoir or aquifer. It is the volume of water that would cover an area of one acre to a depth of one foot. It is equivalent to 43,560 cubic feet or 1233.481 cubic meters. The United Kingdom is increasingly using units of volume according to the SI metric system, namely, the cubic meter and liter. However, some former units of volume are still being used in varying degrees. The volume of an object is equal to its mass divided by its average density (the term "average density" is used for an object that does not have uniform density). This is a rearrangement of the calculation of density as mass per unit volume. The term "specific volume" is used for volume divided by mass, expressed in units such as cubic meters per kilogram (m³•kg-1). It is the reciprocal of density. (1 million liters) A medium-size forest pond. An Olympic-size swimming pool, 25 meters by 50 meters by 2 meters deep, holds at least 2.5 megaliters. Quantity, as in "the volume of ticket sales." Volume, in computing, is a storage area with a single file system, typically residing on a single partition of a hard disk. Volume is a term in data compression, for a file that has been compressed and split into different parts. Ness, Richard M. 1999. “Surfaces and Volumes of Common Shapes.” Ness Engineering Technical Data. Retrieved November 14, 2008. This page was last modified on 25 January 2016, at 20:40.